Knife safety starts with choosing the right knife for the job. 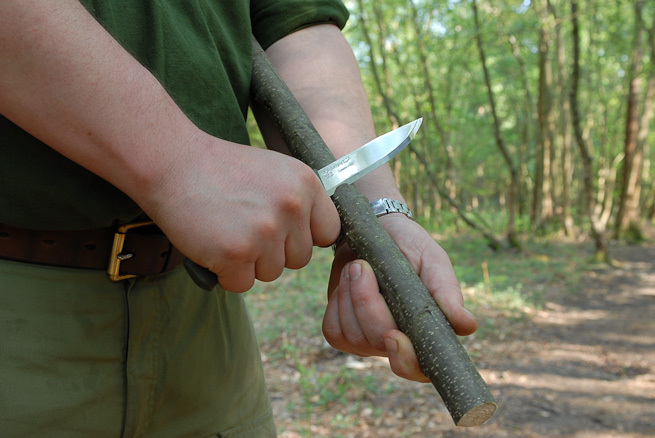 A folding knife can be handy in the outdoors but has an inherent weakness at the hinge. 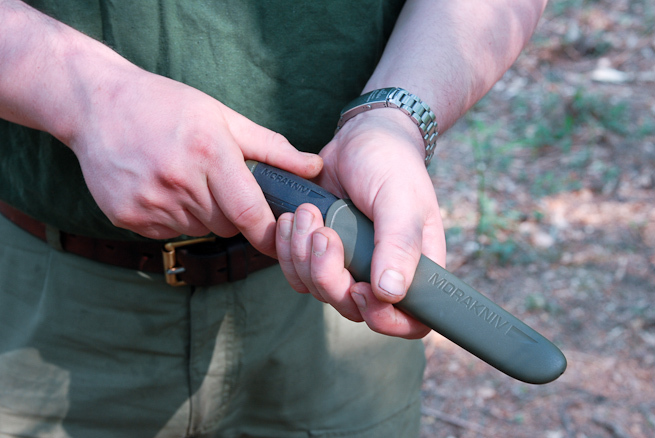 With a fixed blade there is no chance of it folding on your fingers. 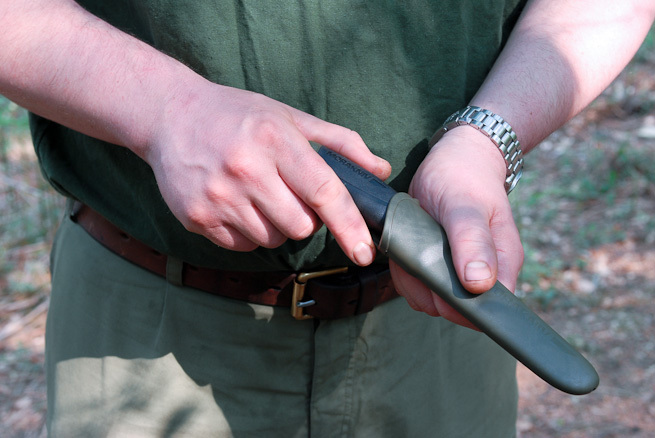 In choosing a fixed-blade knife, select one with a strong sheath. This protects both you and your knife. Believe it or not I've seen people cut themselves quite badly just removing a knife from the sheath. The thing to remember is to keep your fingers away from the cutting edge of a knife when unsheathing it. Be aware of where the cutting edge of your knife is. Photo: Ben Gray. WRONG: Where not to put your fingers when unsheathing a knife. Photo: Ben Gray. Keep your fingers well out of the way. Photo: Ben Gray. 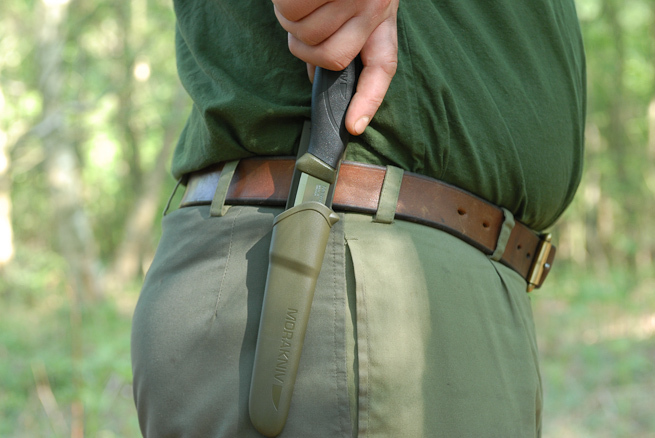 The safest place for your knife is in its sheath. Don’t be tempted to stick it in a log or a tree stump for a few minutes or otherwise leave it lying around. 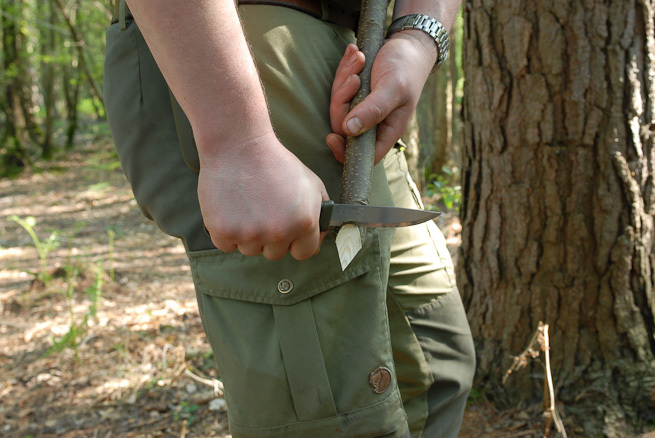 With plenty of potential trip hazards outdoors, replace your knife in its sheath before walking even a short distance. 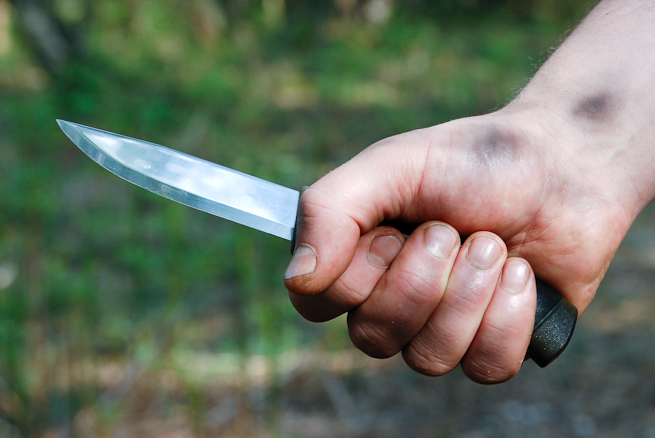 You could cause yourself or others serious injury if you fall with a knife in your hand. The only exception to this rule is if you have been using your knife to prepare raw meat or fish. Clean your knife before returning it to its sheath. Anticipate the need to clean your knife and have cleaning materials ready nearby. Don’t try to use your knife in awkward or confined spaces. Give yourself enough room to use it properly. 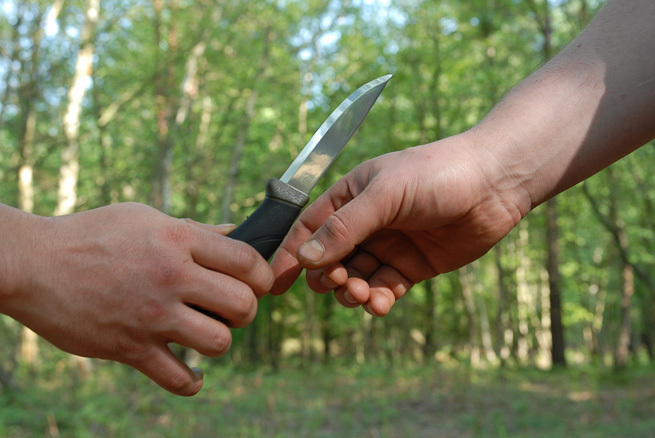 When using your knife, leave enough room around you so that you don’t endanger other people. If someone is within an arm’s reach, they are too close. If you are using a knife, be aware of the movement of other people around you. They may not have noticed you are using a knife. Be aware of others using knives. 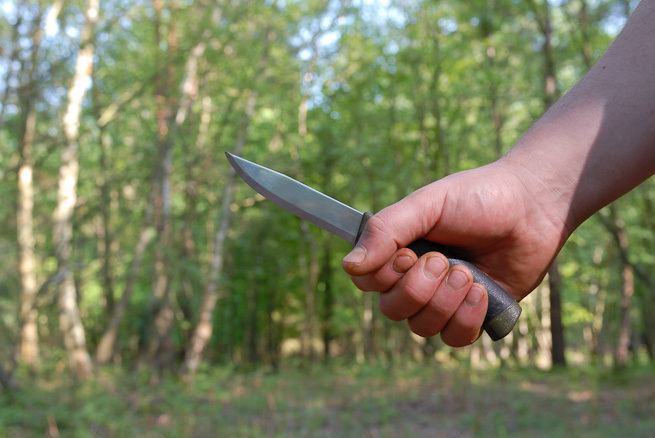 If someone is using a knife nearby, stay at a safe distance. Many cuts are due to a lack of concentration, either due to distractions or tiredness. If you aren’t able to concentrate, put your knife away until you can. The grip used most of the time is the forehand grip. It allows for powerful, safe cuts. The forehand grip is secure and allows for powerful, safe cuts. Photo: Ben Gray. Cut away from your body and cut away from your limbs. Pay particular attention to the position of the hand that is not holding the knife. Cutting away from the body and away from the supporting hand. Photo: Ben Gray. WRONG: Do not cut towards the supporting hand, even if it is on the other side of the work piece. Photo: Ben Gray. Even with a sharp knife, shave off modest amounts of material with each cut of the knife. Trying to remove too much material with each cut will require excessive force, causing tired hand muscles and reduced control of the knife. Remove modest amounts of material with control. Photo: Ben Gray. If you need more power, work on the outside of your body and generate power by dropping your shoulder. Safely create extra power by holding the piece like this and dropping your shoulder. Photo: Ben Gray. 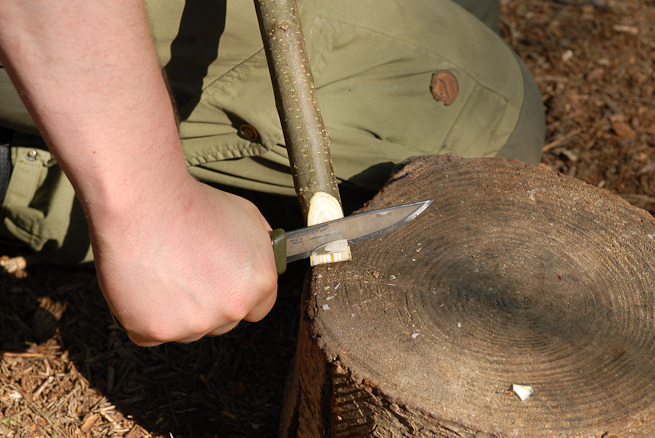 If you need more stability, work onto a log, tree stump or chopping block. For extra support work onto a stable wooden block. Note I’m working towards the outside of my body and my legs are well out of the way. Photo: Ben Gray. Cutting the major artery on the inside of your leg is potentially fatal. Take special care not to use a knife in a way that risks this. A particular concern is carving while sitting down. Keeping your elbows on your knees, prevents the knife coming close to your leg. WRONG: Don’t allow yourself to work with the knife close to your inner thigh. Photo: Ben Gray. WRONG: A slip with the knife here is potentially lethal. Photo: Ben Gray. The right way to do it. Working with elbows on knees forces your hands away from your thighs. Photo: Ben Gray. For every cut you make with your knife, consider where it will go next - not only if things go to plan but also if you slip or if you cut straight through what you are working on. Position yourself so that the next thing your knife hits isn’t you. 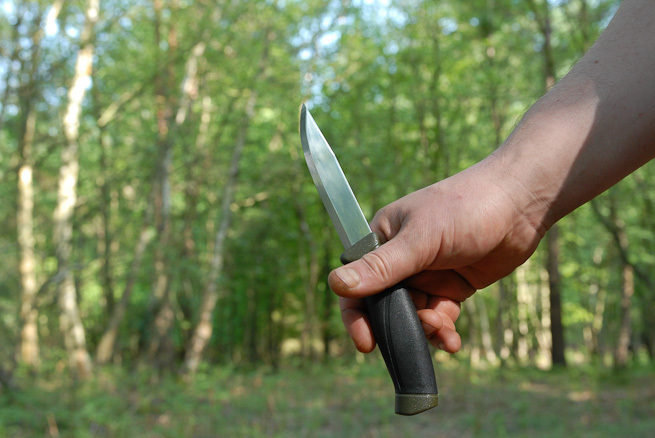 If you feel like you are using your knife in a risky or foolish way, then you probably are. Listen to the little voice in your head that tells you so. Then alter what you are doing so that it is safe. If you can’t figure out a way of safely achieving what you would like, ask someone with more experience for help. Start with the forehand grip. Photo: Ben Gray. Pivot the knife in your hand. Photo: Ben Gray. 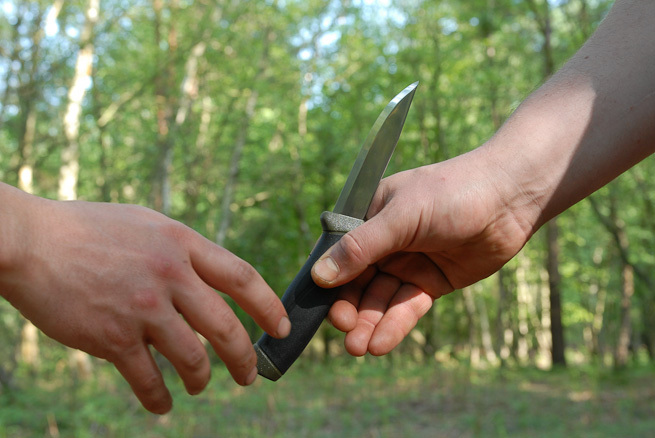 Offer the handle to the person receiving the knife. Photo: Ben Gray. Note the point and sharp edge of the knife is away from both hands. Keep your fingers out of the way of the blade as you pass the knife. Photo: Ben Gray. 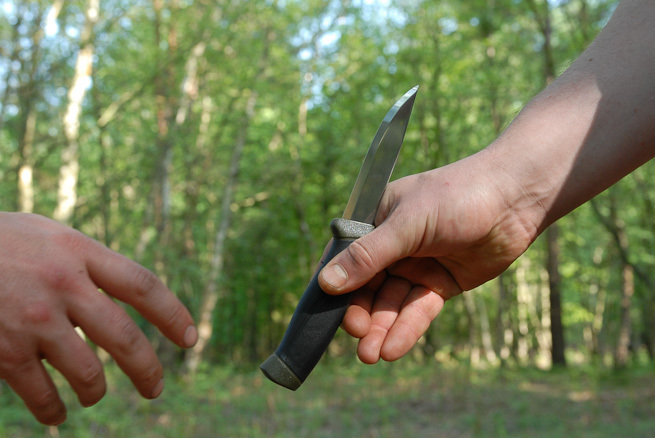 Even if the receiver snatches the knife from your hand, there is no risk of the knife cutting you. Photo: Ben Gray. If you use a knife often you will likely incur a few minor nicks. Having a small first aid kit on your person will help patch up and cuts and prevent infection. A sharp knife is a safe knife. A sharp knife is predictable. You don’t need to apply excessive force when making a cut. If the knife is sharp, it cuts in a familiar way and you easily achieve what you need to. For more about sharpening see the additional resources below. 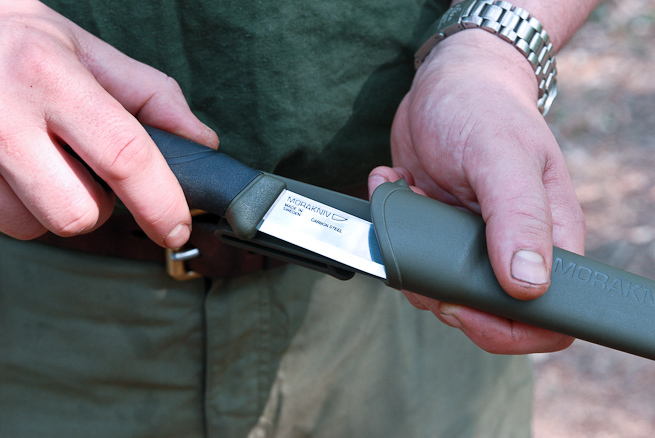 Above is laid out a straightforward set of rules for knife safety. If you apply them each time you pick up a knife, you will significantly reduce the chances of a serious cut. Even if you are an experienced knife user, however, you should never become complacent. Having cut myself many times over the years, particularly when I was young, as well as having taught thousands of people knife techniques over the years, I am more conscious of the importance of applying these rules than ever. 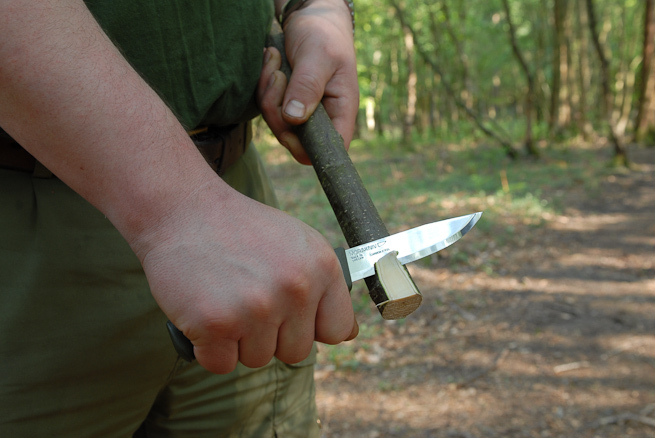 How To Sharpen A Bushcraft Knife Can I Use A Lock Knife For Bushcraft? Great stuff to learn, better than learning the hard way and getting cut. 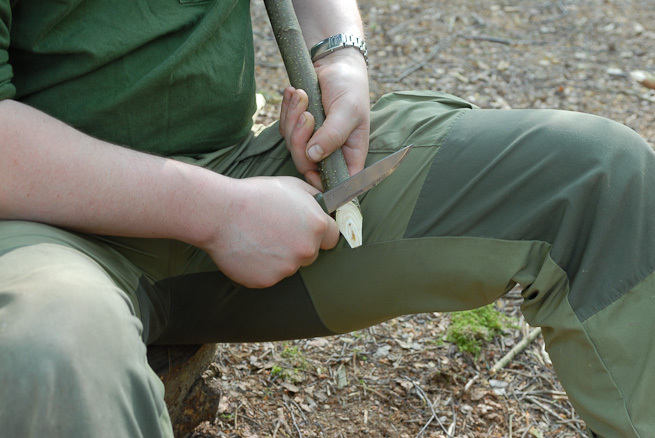 All bushcrafters should learn knife safety first as a must. Indeed, most of the bad cuts I’ve ever seen have been when someone ignores one of these simple rules. As always, a very clear and concise article with good photos and lots of tips! I tend to work with children and teenagers, so I still avoid the ‘elbows on knees’ position as I find that people tend to slip back to the less safe ‘between thighs’ position. Again, a great informative tutorial. I always advise and practice ‘elbows on knees’ and am glad you have participated in the new Haynes manual. Good for you! Thanks for your comment mate. Glad you liked this and thanks for your support! 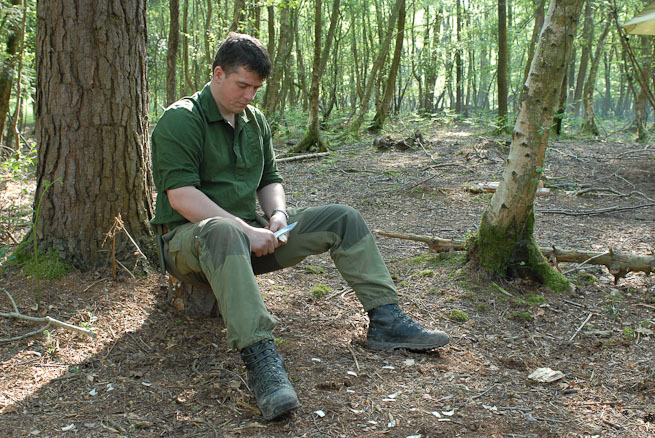 A really great tutorial perfect for when I start my forest schools training look forward to more informative tutorials keep up the good work. Thanks for your comment and kind feedback. I’m glad this will be useful to you. 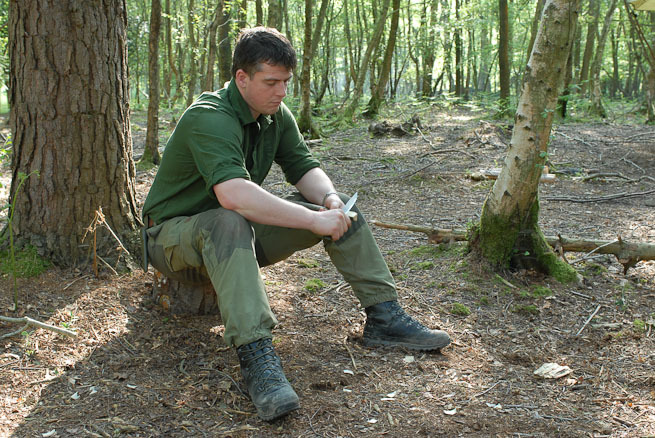 Good luck with your Forest School training. Thanks for this guide! I’m still learning about Knife safety and choosing the right knife. There’s so much information and varying opinions out there, thanks for presenting the facts and helping me to get a clear understanding of what I should be thinking about and considering for my Knives purchase.Thanks again and keep up the good work.This is a reasonable and brief article with great photographs and loads of tips! I have a tendency to work with youngsters and young people, so despite everything I evade the ‘elbows on knees’ position as I find that individuals have a tendency to slip back to the less safe ‘between thighs’ position. The most cuts I have witnessed were due to cleaning a sharp knife with quick movements. Always be extra careful cleaning a sharp blade and make slow movements with the blade pointed away. Awesome article, you make very good points for knife safety. Particularly the one you made about keeping your knife sharp, the only thing more dangerous than a sharp knife is a dull one. Cutting against the grain offers inconsistent cuts which can potentially be harmful to the object you’re carving and yourself. It is mostly true that cutting away from yourself is usually the safest but, unless you know and have practiced your cutting techniques. Thumb Brace Pairing Cut: The blade of the knife will face your body while your thumb on the same hand will be directly opposite of the edge of the blade. In this manner you’ll pull the knife towards your thumb, much like when hold a piece of fruit and cutting or peeling it. The thumb brace cut is important for smoothing and forming contours in your work. 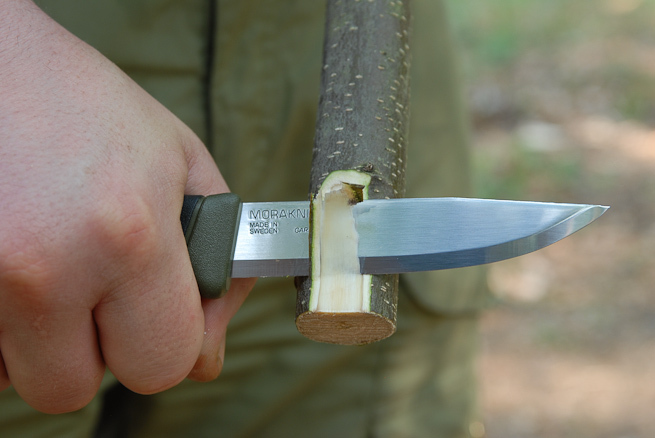 Rough Push Cut (this is the cutting example given in this article): All whittling projects begin with the rough cut. Holding your knife with the grain you’ll take off large portions of wood. Be careful to not get overzealous as deeper cuts have a tendency to break off instead of shaving off. The importance of this cut is taking large portions out of the wood in a quick manner. V-Notching (V-Cut): Notching can be used for delicate features such as hair, fur, etc. but also for deeper cuts you might need to form ears or the slender neck of an animal. To use notching place your piece of wood flat onto a table and make a cut at 30 degrees into the wood to the desired depth. Pull back the blade and make the same 30 degree cut parallel to the first cut and too the same depth. Depending on how deep the cuts were when you pull away you’ll either have a small groove or a larger chunk removed. Thumb Push Cut: is used when absolute control of the blade is necessary. With the thumb push cut you use the thumb of the holding hand (the hand which is holding the object you’re whittling) to push against the thumb of the knife hand on the back of the blade. To simplify, you’re using your knife hand to control the blade while your other hand supplies the pressure for the cut. The thumb push cut is key to little changes made to a project when only a smidge needs to be shaved off here and there. Again, awesome article, and wonderful points! Surprised you didn’t include the chest pull among these skills. I find that technique the best for control and safety.